Performance Monitor is a great tool for collecting and analyzing performance data in Windows and Windows Server. There are many counters available that one can look at to help understand how the system is performing. Unfortunately analysis of performance data may not always be straightforward for some system administrators. Luckily, there is the built-in Data Collector Set for Active Directory Diagnostics in Windows Server once the Active Directory Domain Services role is installed on a machine. This feature makes the life of an Active Directory administrator easy as most of the analysis is automated. In this blog post, I briefly explain how the Active Directory Diagnostics works. I also take you through what I see in some environments where this feature does not work due to inadequate user rights. 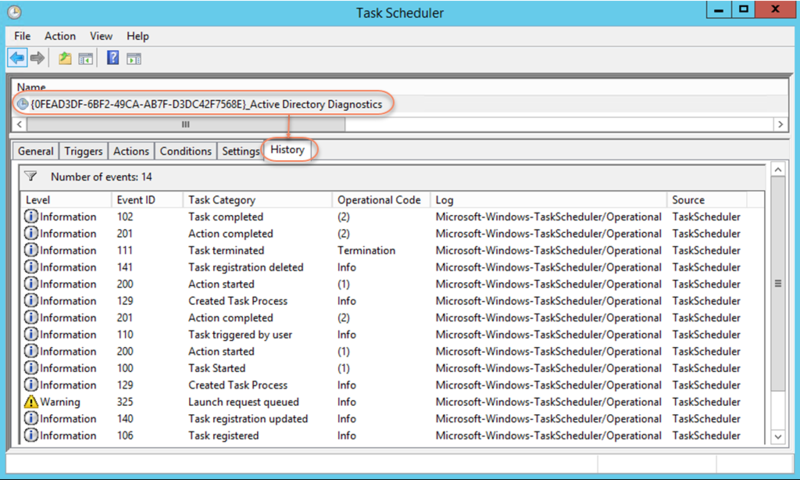 Say you are already familiar with the Active Directory (AD) Diagnostics Data Collector Set (DCS) in Performance Monitor, or you have read this blog post and are interested in a report similar to the one below created by the default AD DCS. In the example, we see that there is a warning indicating that the system is experiencing excessive paging. The cause here is that available memory on the system is low. The report also suggests that we upgrade the physical memory or reduce system load. This report allows us to drill into desired areas of interest such as Active Directory, CPU, network, disk, memory, etc. Unfortunately the AD DCS may fail to start in some instances due to inadequate user rights, which I see often in the field. Instead of starting up and visually indicating with the green play icon as depicted below, there would not even be a pop-up dialog box with a warning or error indicating that there is a problem – the DCS just does not start! Before we get into what exactly the issue is and how we would go about resolving it, let us briefly take a look at how this feature works. From the image above, we can see Event ID 101. 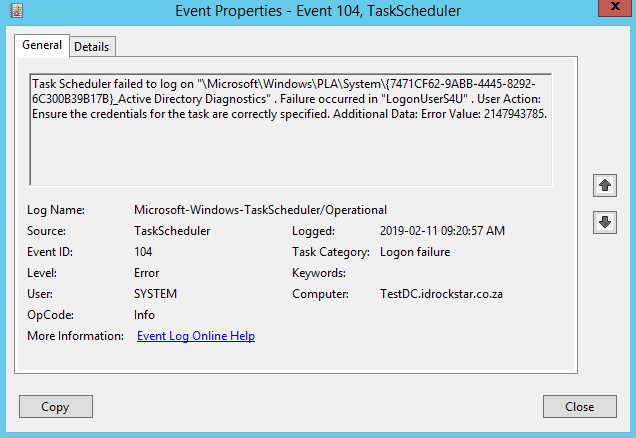 This event means the Task Scheduler failed to start the AD Diagnostics task for the currently logged on user. You may begin to wonder at this stage as you are currently logged on to the DC with an account that is in the Domain Admins group. What permissions/rights are missing? The log on as a batch job user right assignment, which determines which accounts can log on by using a batch-queue tool such as the Task Scheduler service. I observed something interesting when I tested on a few Windows Server 2016 machines in my lab. Default groups are pre-populated when you modify this setting, therefore, chances of accidentally hurting yourself are lower. 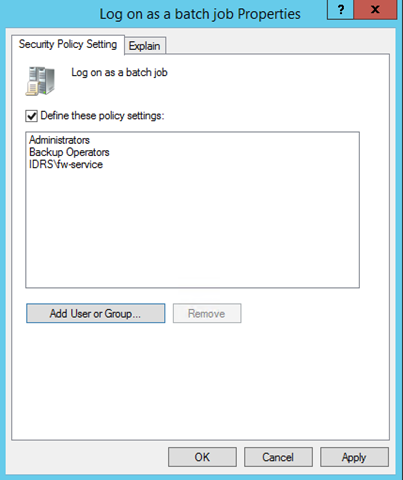 Be careful when modifying policy settings such as User Rights Assignments as you could end up seeing unexpected results if they are not properly configured. 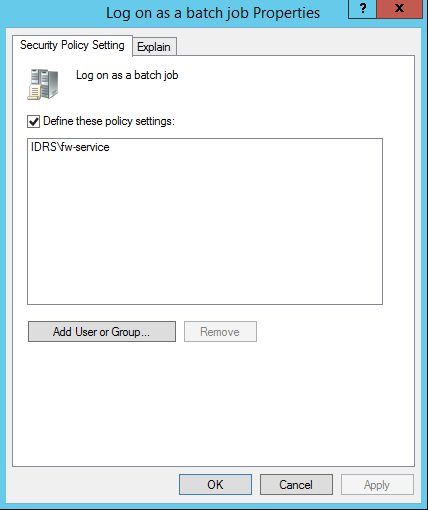 In this instance, the Administrators and Backup Operators groups would have to be explicitly added with the IDRSfw-service account in order not to negatively impact the default behavior. Be sure check tools such as the Policy Analyzer and the Security Compliance Manager for guidance on what the recommendations are. This is one example and there are others, such as the inability to add a new DC to an existing domain due to lack inadequate rights!